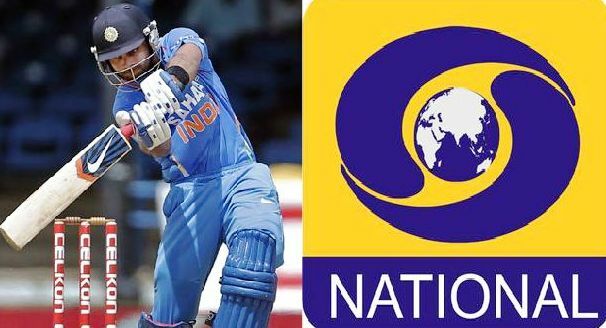 Now you can watch DD National Live Cricket Match on all DTH and cable TV services without paying for expensive sports TV packs. DTH will have to share cricket with DD. The proposal would allow sports viewers to avoid subscribing to expensive channels. In a bonanza for citizens who love cricket in the country, the government of India is considering to introduce some regulations to allow the transmission of cricket matches on Doordarshan channels offered by DTH TV service providers and cable TV service in India. Currently, only cricket matches of national importance are allowed in Doordarshan and that only in the terrestrial network of the Doordarshan national station and on DD free dish. The sources stated that the Union's Ministry of Information and Broadcasting has sought the opinion of the law and the Ministry of Justice regarding the issue. It is believed that the high officials of the ministry are studying the proposal to necessarily share the provision of food by television for those who can not pay the cable television subscription. It is known that the decision to introduce the new broadcast regulations to facilitate the transmission of cricket matches comes after the Supreme Court's decision last year that Prasar Bharati can broadcast the signal from private broadcasters, only on the terrestrial network and Free Dish but not on Doordarshan channels. by cable operators and private DTH platforms. The Supreme Court's ruling last year on the subject meant that Prasar Bharati can not share the information it receives from rights holders on Doordarshan channels that must be mandatorily transmitted by all cable and DTH companies. Under the 2007 Mandatory Sharing with Prasar Bharati Act, private broadcasters are required to share live broadcast signals of nationally important sports events with Prasar Bharati. But Section 8 of the Cable Television Network Act requires all cable operators to carry two Doordarshan channels. The proposed changes would mean that cable operators can access the transmission of sporting events through two channels, through private channels, through the payment of subscription fees, and through Doordarshan channels. The sources indicated that this would also allow sports spectators to avoid subscribing to expensive rackets of sports channels and to comply with the Doordarshan channels that are broadcast on the respective DTH platforms.